In western culture, you don’t often see elaborately carved fruit, even in the fanciest of restaurants. Yes, food presentation is meticulous, but it doesn’t usually involve an artist chiseling away at it for hours to create a work of art or showpiece. Similar traditions exist using chocolate or ice as the medium, but not fruit so much. Every Halloween, some families across the UK or America might spend a bit of time creating a jack-o’-lantern by hollowing out a pumpkin and carving a face in it. In 1980s cookery schools, British chefs learnt how to create rose-shaped garnishes with tomato skins. But there’s no long tradition of fruit carving like there is in Thailand. How far back does its history go? And what does it involve? Fruit carving has been a tradition in Thailand for hundreds of years. It goes back to the royal Sukhothai dynasty of the 14th century. In the beginning it was an art form reserved for royalty, and it was mainly royal palaces where female artists created fabulous fruit carvings to honour monarchs. Today, fruit carving is sufficiently mainstream that it can be studied in Thailand’s art schools, but it’s not enough in demand that students can expect to make a good living from it. Thus, the tradition’s future is under threat. For the moment, it thrives. Thai fruit carving is an intrinsic part of Thailand’s Songkran New Year’s holiday and other special events such as weddings. Spectacular displays of fruit and vegetable carving are presented as an offering in many of the country’s incredible temples. 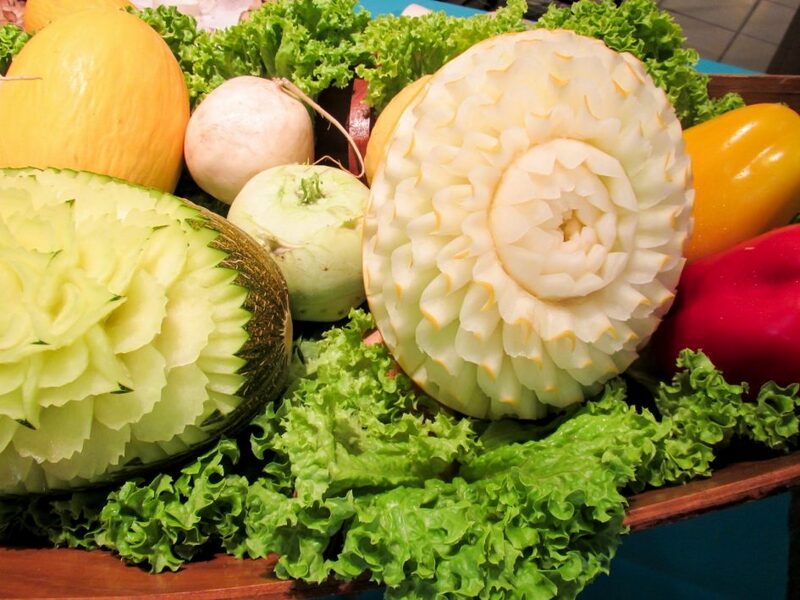 Aside from being taught in schools and universities in Thailand, fruit and vegetable carving can be learnt at dedicated culinary schools. You can take classes at venues such as the Bangkok Thai Culinary School or the Siam Carving Academy. You can also learn this satisfying art here in the UK or America and other countries. It’s taught in specialist western cookery schools or remotely via DVDs. Fruit-carving knives are fascinating enough in themselves to look at. As you might expect, they’re typically very intricate, curved and sharp and don’t look much like stock chef’s knives. Some sets of fruit-carving knives are handmade and beautifully decorated—art within art. Fruit carvers also use other specialist tools such as peelers, zig-zag cutters and crinkle cutters. 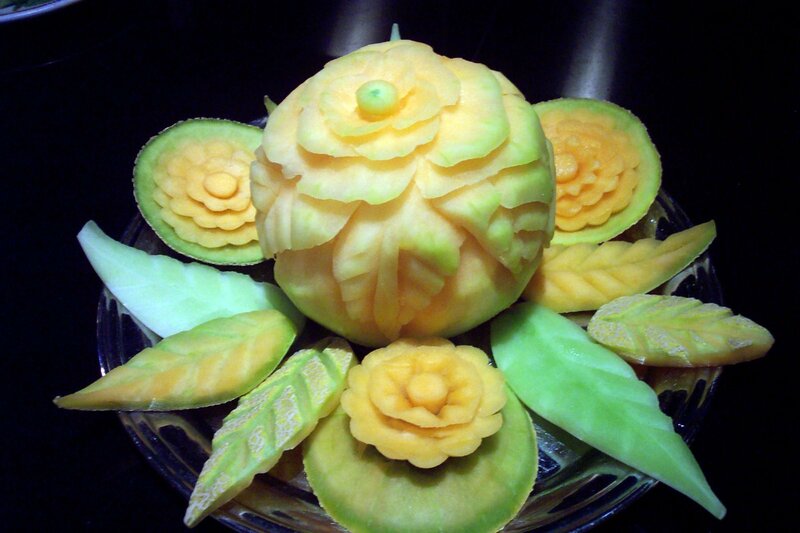 Learning the art of Thai fruit and vegetable carving offers plenty of personal benefits. More than anything, it requires concentration, and through concentration comes relaxation. Plus, you get to show off your amazing creations to friends and family.